It's no secret why the number one enhancement that clients ask for is up lighting. Just look at the way it transforms a room! 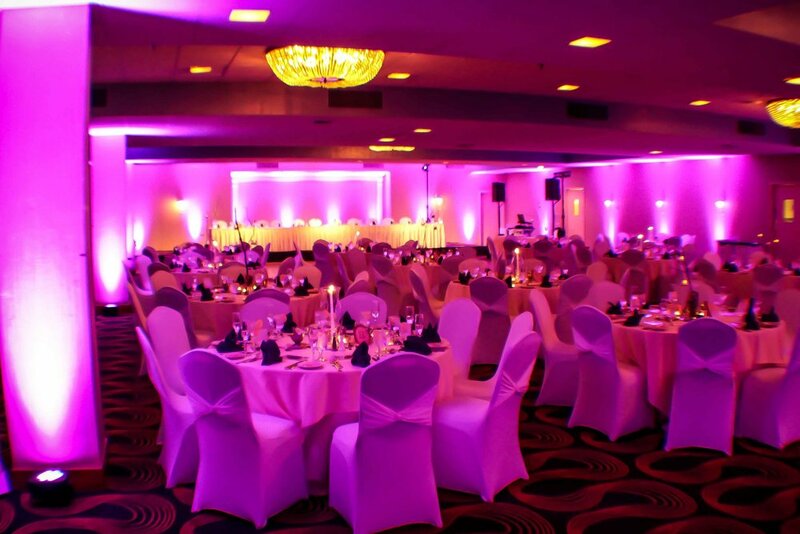 With Sound Express, we don't bring just a few lights, we bring FULL ROOM up lighting. As you can see by the pictures, virtually the entire wall is covered in your color of choice. We can also custom mix and match any color you'd like, and change those colors instantly with our remote DMX controller (video below). Don't settle for a couple of lights on each wall that are set to a single color that's CLOSE to your color. Get full room coverage of your lighting with the exact shade you're looking for. Sound Express does lighting RIGHT! 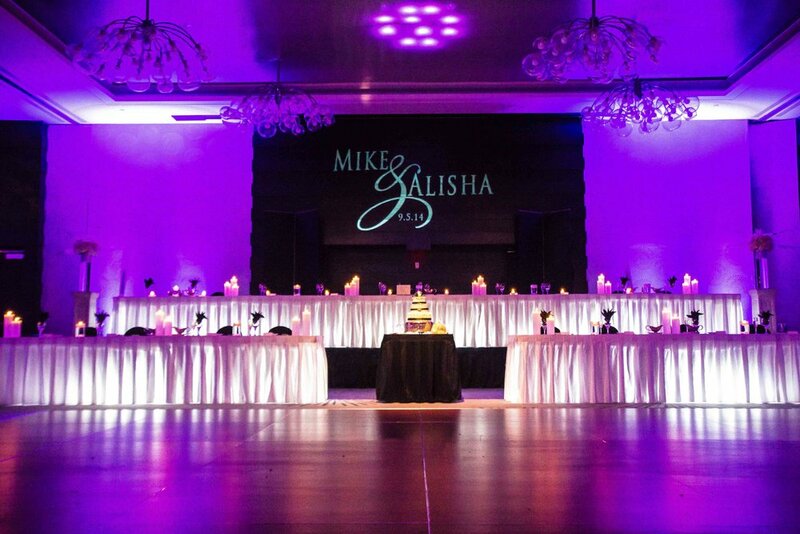 Check out our videos and other lighting options below, or head over to our gallery page to see more photos from our favorite venues. Consider yourself enrolled in Up Lighting 101. 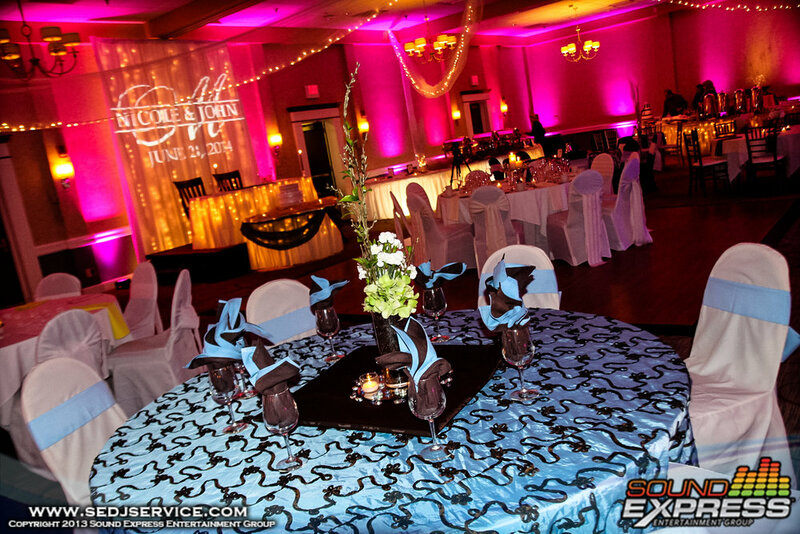 See what cool things we can do at your event with our wireless DMX Lighting and controller's. Don't go with just average. Sound Express offers so much more, and yes, it's OK to watch if you're another DJ company. You can enroll as well. We encourage you to watch and learn how we do things to step up your game! Check out some Up Lighting photos in our Gallery. 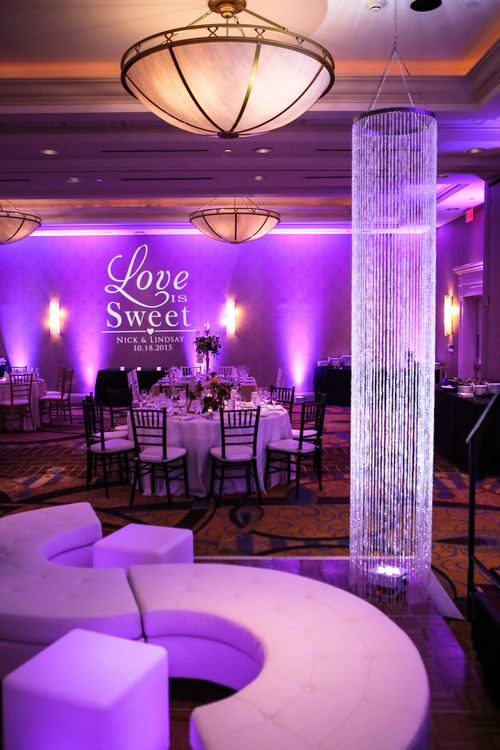 Add that extra personalized touch with a custom monogram to be displayed on a wall, dance floor, or even the ballroom ceiling. You can have your names, initials, wedding date, or a custom logo. We can even incorporate the design to match your photo booth template. Pin spotting is used to light up and draw attention to various area's at your event. Pin spotting can help showcase your floral centerpieces, bring attention to the cake, or even create visible walkways for outdoor nighttime events. Pin spotting is an inexpensive and great way to make anything part of your reception beautifully visible.